MARGARET MERRITT: Printmaker and Papermaker - "Summer!" 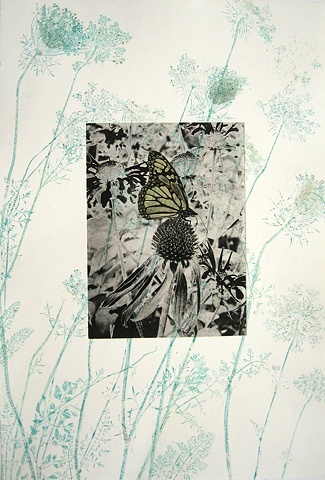 Butterflies flitting from coneflower to Queen Anne's Lace--all featured in this monoprint--strike me as the essence of a warm August afternoon. This print, one of a series, was made from first printing images of the flower and its foliage directly from the inked plant material. A solar plate etching was then used to add the butterfly/coneflower image over this background.